(North Bergen—November 24, 2015) High Tech’s Hayoung Park, a resident of Bayonne, has just authored a 114-page educational book geared for high school students studying to take the PSAT, announced Dr. Joseph Giammarella, Principal of High Tech High School. Created and reviewed by Park herself, a perfect scorer on the PSAT, SAT, and SAT II Math Exam, Hayoung’s Advanced Math Compatible with New PSAT, offered by CreateSpace Independent Publishing Platform, provides three practice tests for the revised PSAT and questions consistent with the precise styles and techniques that the new PSAT demands. 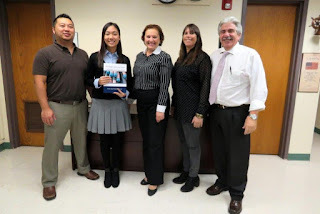 Over the summer, Park personally deconstructed four Collegeboard-released tests, solved the problems, identified strategies, and researched percentages of questions on the tests according to various topics, including Algebra, Trigonometry, and Data Analysis.